They're not much to look at. They're almost like little baby stinkbugs. But they don't taste half bad. And they're great for protein and fiber. Sure, they've got some fat, too. But it's that good fat that we've heard so much about. 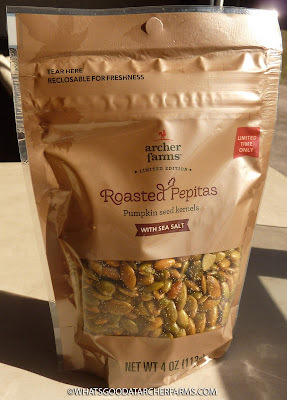 These pepitas come in a handy resealable bag and they're covered in sea salt. They taste pretty fresh straight out of the bag, and they last a long time by virtue of the ziplock and the plentiful salt. Our bag has a freshness date of July 28, 2019. So we're still in the "best by" zone, even though we bought these during the fall—I wanna say October. They've been in our RV pantry drawer ever since, and probably opened for at least half of that time. Apparently, these are just a seasonal item. They aren't available in stores or online at this point. So I guess this review will come in handy when you're shopping this coming fall in about seven or eight months. I'm assuming Target will bring them back. If you've ever taken a pumpkin and tried to roast the seeds yourself, you'll know that they usually have a white-ish shell on the outside. It's perfectly edible, but the good part is the seed kernel, which is all you're getting here. I'm not sure if they have a machine that can take off those outer shells or what, but it's incredibly annoying to do it by hand. Yet more convenience with this product. Yay! Not much to complain about here, but it's also not earth-shatteringly different for any reason, either. 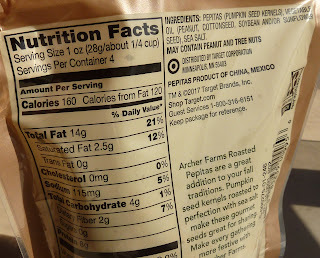 There's still some seeds in the bag after nearly 5 months, so this isn't my favorite snack of all time, but I'd consider buying them again if I ever got a hankering. I give this bag o' seeds 7 out of 10 stars.